This post is going to be a little, if not a lot unorganized and chaotic. My mind is everywhere after the past few days, and you'll probably wonder why I'd even want to blog about it...but I need some release for my thoughts and fears - it's cathartic. I'll start from Sunday and work my way through the week. Other days may be on different posts. once she was there - that surgery would soon follow, and I wasn't ready. At 8am Monday morning we were sceptical whether the move would happen. At 10am we were given a 10minute warning that the CATS (Children's Acute Transfer Service) were on their way to collect her. 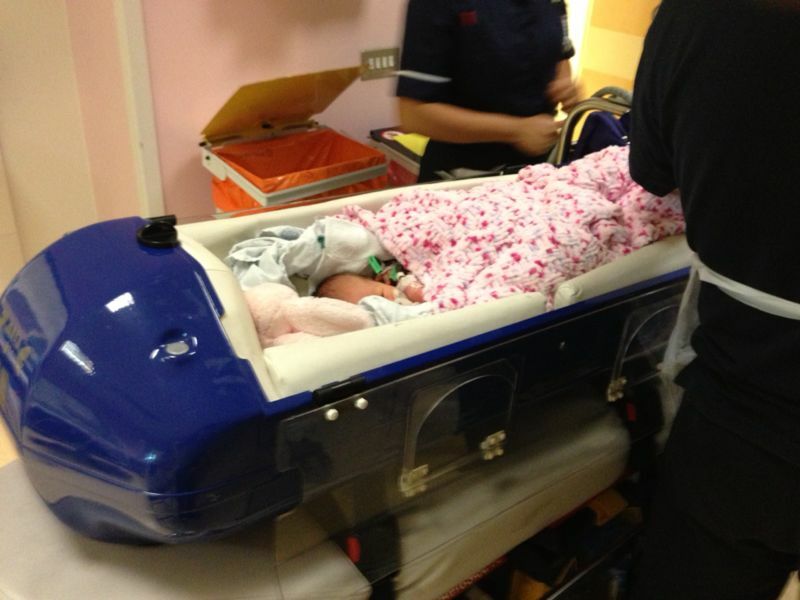 They arrived on the ward with what I can only describe as a Bobsleigh. If it wasn't such a serious situation I would have been in stitches laughing at the sight of her strapped in there, eyes wide open wondering where the hell she was going. It's so heartbreaking when you think that so far - the short journey from hospital to hospital is the only time she's spent on the outside world. Watching them wheel her out of the ward was awful, my poor little girl going for a ride in am ambulance and she had no idea. As we sat down in the Hospital cafe the CATS team phoned Mark to say they had arrived safely and that they'd handed her over to GOSH. She was in Cot 13 - typical! 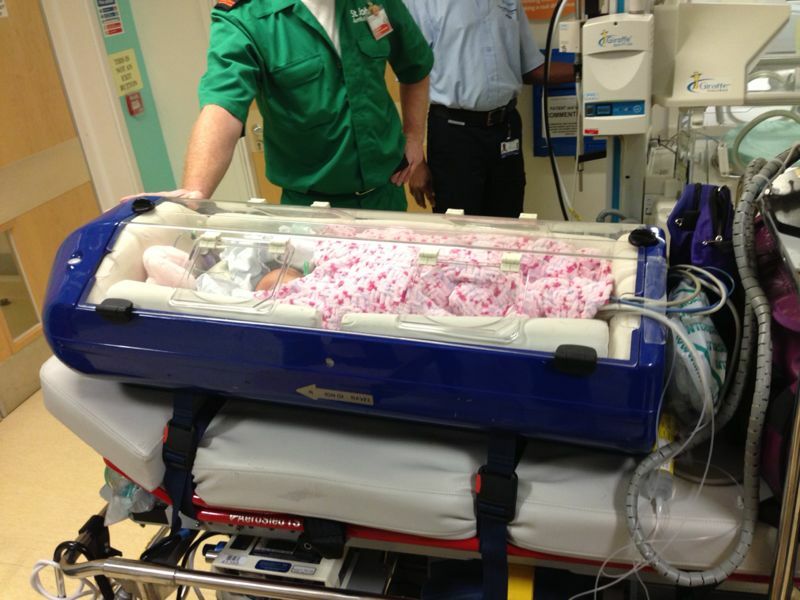 She had always seemed so big in UCLH, mainly because she was inside an incubator. When we finally made our way across to GOSH and found Cot 13, she was now in a normal glass Cot. She looked tiny. Where as previously she'd been dressed only in a nappy - she was now swaddled in a blanket which made her look even smaller, we could only see her tiny face. We met a Doctor that very afternoon who told us they were booking her operation for the very next day. This was it, it was all happening - and so, so fast!!! I knew this is why we were here. I knew that she couldn't survive without the surgery. But that doesn't make it any easier. I just wished she didn't require surgery full stop. The rest of the afternoon was a constant stream of Doctor's, Consultants, Specialists, test after test after test. An Echo was performed which seemed to take forever. Having to hold Martha still was a hell of a challenge as they needed images from all sorts of angles, and she had to be held in the most uncomfortable positions for this. At thea end of the Echo the technician very matter of factly said (in a French accent) "Ok...I don't think they will be able to close the VSD!!! But we'll discuss it in the morning". To which I freaked out - how the hell was I supposed to take that? I demanded he explained what he meant. Apparently as the VSD is so large and her actual heart is small they don't repair VSD's in babies under 3kg (Martha was 2.75kg) but what they would do instead is fit a band around her Pulmonary Aorta to stop her lungs being flooded with blood and bring her back for another operation in a few months when she is bigger to close the VSD. Once I was given this explanation I was fine. Well maybe not fine but I wasn't freaking out as much anymore. But this was it...what we'd come to London for. I only hoped I was doing the right thing.